We’re all fascinated by twins, whether it’s the charming movie of the same name with Messrs De Vito and Schwarzenegger or the ditsy Vegas girls from The Bachelor. According to a study in the American Journal of Obstetrics and Gynecology, in 2006, the rate of twin pregnancies in the United States was 32 per 1000 births. It’s rare and it’s genetic, but it’s their use in nature/nurture studies that probably piqued Cronenberg’s interest, what with his background in the biological sciences. 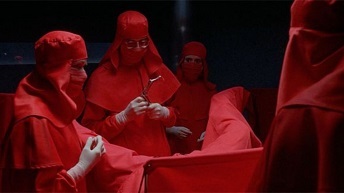 Like Cronenberg’s early horrors, Dead Ringers is a mutant movie, in this case, “mutant women” treated by a team of twin brother gynecologists, the Doctors Mantle, who operate out of a high-tech Toronto clinic where their surgical team dress like Spanish Inquisitors in showy red robes. One the docs has designed a solid gold “retractor”: a creepy instrument that he wants to take from the coroner’s table to the gynecologist’s chair. And they date the same women surreptitiously (obviously the most fun you can have as a twin) while abusing drugs and alcohol. One of these women, Claire Niveau, is a small time TV actress (played terrifically by Geneviève Bujold), a “mutant” possessed of a “trifurcated cervix,” most likely making her infertile. Elliot, much like he does with his other patients, attempts to seduce her, then passes her off to his meeker brother. As Elliot’s drug abuse begins to take more of a toll, he commissions a local artist to cast experimental gynecological implements out of metal, and that’s where Cronenberg really turns his horror obsessions inward. And it’s as clinical as Cronenberg’s ever been, but given the circumstances, with good reason.